Beer is made from natural ingredients and has relatively low (or zero) alcohol content compared to most other alcoholic beverages. Drinking beer in moderation can have a positive effect on life expectancy, due to the alcohol in it. There is a J-shaped relationship between alcohol consumption and all-cause mortality, with the lowest relative risk (with an approximate 10% decrease) associated with the consumption of around 20 g of alcohol per day for men and 10 g of alcohol per day for women. This effect is the sum of the positive effects on cardiovascular disease risk at moderate intake and the negative effects on certain cancers and accidents with higher consumption. It is unrelated to the type of alcoholic beverage. Beer is a versatile drink with a relatively low alcohol percentage, that when drank in moderation, can be part of an adult’s healthy lifestyle. Drinking beer in moderation may have positive effects on life expectancy, mainly due to the presence of alcohol. In addition to the effects associated with alcohol, other properties of beer arising from the raw materials and brewing processes, may also have positive effects on health. However, moderate alcohol consumption should always be considered as a supplement to, and not as an alternative to, other healthy lifestyle choices that lower the risk of coronary heart disease, type 2 diabetes and other diseases. People who do drink beer or other alcoholic beverages are encouraged to drink in moderation as part of a healthy diet. For people who don’t want to consume alcohol, non-alcoholic beer can be a good alternative. A population study in 1926 had already shown that moderate drinkers live longer than abstainers and heavy drinkers,283 and a J-shaped relationship between alcohol consumption and mortality risk has also been seen in numerous other studies performed more recently (see Table 7 and Figure 11). Overall, the lowest mortality relative risk with about a 10% decrease is observed with the consumption of around 20 g of alcohol per day for men and 10 g of alcohol per day for women. The relative risk increases again with a consumption of more than 40 g of alcohol per day for men and 20 g of alcohol per day for women. The net health benefit from moderate alcohol consumption is thought to act primarily through its cardio-protective effect (see Chapter 5), though increased alcohol consumption is also associated with an increased risk of certain cancers (see Chapter 7) and death from accidents. The J-shaped relationship between alcohol consumption and all-cause mortality is a combined result from many studies. The challenge with these is that residual, unmeasured or confounding results can never be completely excluded. Few epidemiological observations, however, have been scrutinised for bias as thoroughly as the apparent health benefits of moderate alcohol consumption, 292but some uncertainty remains regarding the causal nature of the J-shaped association seen in population studies. Several methodological flaws have been shown in alcohol research that might produce apparent benefits of moderate drinking, as discussed below. Another potential source of confounding evidence is the suggested healthier lifestyle of moderate drinkers, or conversely, non-drinkers may show an adverse risk profile. 294,295Some studies suggest that the J-shaped relationship between alcohol consumption, cardiovascular disease (CVD) and type 2 diabetes is not likely to be explained by a healthy lifestyle. However, even in those with a healthy lifestyle, moderate alcohol consumption is associated with an additionally lower risk of CVD and type 2 diabetes (see Chapters 5 and 6). 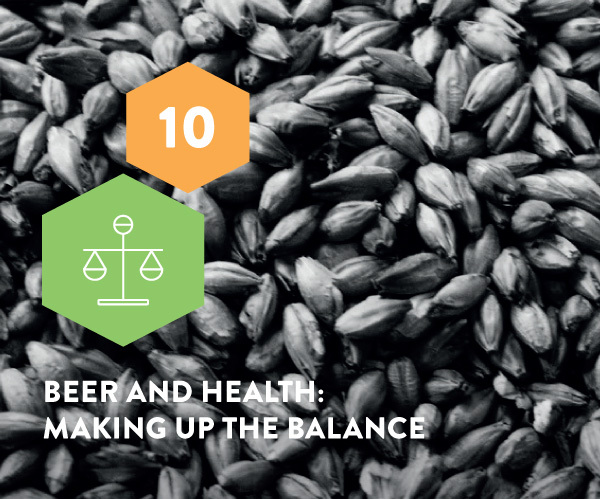 All the previous chapters in this booklet show us that beer is a versatile drink with relatively low alcohol percentage, that when drank in moderation, can be part of an adult’s healthy lifestyle. Due to the natural ingredients there are small amounts of B vitamins, minerals, polyphenols and fibre in beer. And because of the alcohol there may be positive effects on life expectancy. For people who don’t want to consume alcohol, non-alcoholic beer can be a good alternative. Although residual confounding results cannot be excluded, it would be unlikely that they would modify the presented scenarios in any substantial way. 285The consistency and temporal sequence in epidemiological studies and the plausible biological explanations in experimental studies all favour the conclusion that moderate alcohol consumption does have beneficial health effects, 299and the benefits of moderate drinking is relevant for public health. 285However, moderate alcohol consumption should always be considered as a supplement to, and not as an alternative to, other healthy lifestyle habits that also lower the risk of chronic diseases, such as coronary heart disease and diabetes. Although moderate beer consumption may have health benefits, you do not have to drink beer in moderate amounts for a healthy lifestyle. To ensure a healthy lifestyle, the World Health Organization (WHO) recommends eating lots of fruit and vegetables, reducing fat, sugar and salt intake, and exercising. What is important, is that if you do drink beer, to do so responsibly and in moderation.